Figure 1. Map of the planned expedition for May 2014 East Coast Mapping Expedition. 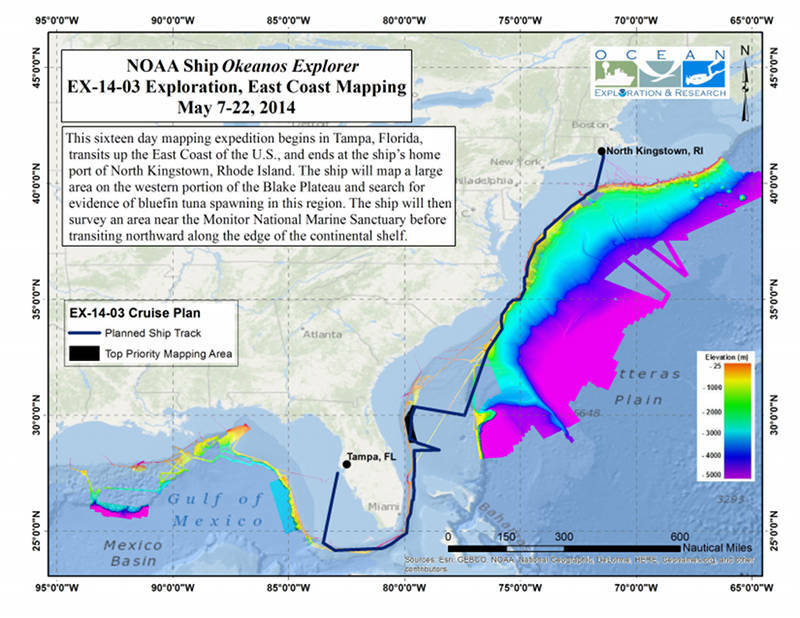 Image courtesy of the NOAA Ship Okeanos Explorer Expedition 14-03: Exploration, East Coast Mapping. Download larger version (jpg, 3.4 MB). From May 7-May 22, 2014, NOAA Ship Okeanos Explorer will conduct a 16-day mapping expedition beginning in Tampa, Florida, and ending at the ship’s home port of North Kingstown, Rhode Island. Exploratory ocean mapping will occur at all times during the expedition as the Okeanos Explorer voyages around the Florida Keys and heads northward along the U.S. East Coast. Refer to Figure 1 for a map of the planned route for the expedition. Large regions in the South Atlantic remain poorly explored in part due to the difficulties of studying deep areas in the path of the strong Gulf Stream current. During planning for this cruise, significant input was provided by ocean scientists and managers in the Southeastern United States to identify top priority areas for deep-water ocean exploration. Based on this input, a large region offshore of northeastern Florida and southern Georgia on the western portion of the Blake Plateau was selected as the primary focus area for mapping operations during this expedition. This region of the plateau is generally referred to as Stetson Mesa and mostly lacks high resolution maps of the seafloor. In 2010, this area was designated by the South Atlantic Fishery Management Council as a deep coral Habitat Area of Particular Concern due to the presence of deep-sea corals and other important fisheries habitat. Deep-sea coral habitats are an important component of the deep-sea ecosystem and can be negatively impacted by bottom-tending fishing gear and other human disturbances. Detailed mapping of the habitats within this marine protected area will provide critical information to resource managers and be used to directly inform management decisions about the region. For more information on deep-sea coral protection efforts in this region, refer to NOAA's Southeast Fisheries Science Center. Another exciting aspect of this exploration cruise will be working with scientists from NOAA’s Northeast and Southeast Fisheries Science Centers to investigate the possibility of a previously undocumented spawning area for bluefin tuna on the Blake Plateau. This plateau is a prominent extension of the continental shelf off the southeast United States. A fine mesh plankton net will be towed at select sampling locations over the plateau to hopefully find bluefin tuna eggs and larvae, which would indicate spawning activity in the region. If bluefin tuna larvae are found in this area, this would be a major discovery in terms of the life history of an extraordinary large marine predator - one of the fastest, largest, and furthest migrating fish species on the planet. This species is also a prized recreational and commercial fishery of international importance and is at critically low population levels, so new information that will help conserve this species is greatly needed. Conductivity, temperature, dissolved oxygen, fluorometer measurements, and water samples will also be taken in this region to characterize oceanographic conditions and provide data to NOAA’s Ocean Acidification Program. The water samples and data collected will provide information on carbon, physical, and biogeochemical parameters as they relate to the increasing acidity of the oceans as they absorb larger amounts of atmospheric carbon dioxide. Moving further northward on our journey, the Okeanos Explorer will map select areas in the vicinity of the Monitor National Marine Sanctuary offshore of Cape Hatteras, North Carolina, in order to help archaeologists search for additional Underwater Cultural Heritage sites, such as shipwrecks. This region of the U.S. contains many intriguing wreck sites of historical importance – only some of which have been discovered. The final stage of our expedition northward will involve mapping along the edge of the continental shelf of the U.S. eastern seaboard. This edge is where the relatively shallow coastal shelf seafloor dramatically slopes down to the deep sea, forming complex and rugged ocean canyons. The majority of these canyons were mapped during 2012 and 2013 Okeanos Explorer cruises as part of a major exploration initiative referred to as the Atlantic Canyons Undersea Mapping Expeditions or ACUMEN. As we take the ship north to its home port in Rhode Island, we will traverse the heads of these canyons and map along the edge of the continental shelf to add to existing high resolution multibeam sonar mapping coverage of this fascinating area. During previous expeditions to this Atlantic Canyons region, the ship discovered many locations where gaseous seeps emit plumes of bubbles from the seafloor. Using the advanced multibeam sonar on the Okeanos Explorer, these bubble plumes can be detected in the water column. These gaseous seeps can support unique biological communities of organisms that scientists are just beginning to understand, so the ship will be on the hunt for new seep locations as well as re-visiting previously discovered seeps to assess their persistence over time. The mission of NOAA’s Teacher at Sea Program is to provide teachers hands-on, real-world research experience working at sea with world-renowned NOAA scientists, thereby giving them unique insight into oceanic and atmospheric research crucial to the nation. Nearly 700 teachers have participated in this program since 1990. This will be the first Okeanos Explorer expedition to host a Teacher at Sea. David Murk is a fifth grade teacher at an elementary school in Carpentersville, Illinois, and will be joining the expedition to help with the bluefin tuna plankton tows and ocean acidification water sampling work, create blog posts of our cruise activities, take sun photometer measurements as part of a long-term research collaboration with onshore scientists at NASA, and learn about career opportunities at sea to share with his students.